"Wherever I could, I would do the shows." As a successful playwright, Sam Bobrick has written over 40 plays that have been performed on stages all over the world. That's his first love. And at 85, Sam is still romancing the jones. But I was first introduced to Sam Bobrick via his eclectic television work. Shows like "The Andy Griffith Show" and "Get Smart." "Saved By The Bell" and "The Smothers Brothers Comedy Hour," just to name a few. And any number of variety shows that were so prevalent in the 60s and 70s. To add a bit of sprinkles to the cupcake, "The Big E" recorded one of his songs after his return from Germany. And for the final kicker...Sam even held hands for a little while with Mad Magazine. Sam Bobrick might not be a household name...but he's been in your house! 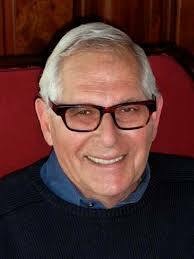 Casey Chambers: Of all the tv shows you've written for, and there were many, the classic mainstay around our house is..."The Andy Griffith Show." How did you begin writing for that series? Sam Bobrick: I was originally a writer in New York and I was struggling. I wanted to write songs, but the music business didn't turn out the way I wanted. I had the Elvis Presley song and a couple of other songs. And I was picking up money writing for game shows. I wrote for "Captain Kangaroo" for awhile...but I just couldn't make a living. So, I had a very good friend who was an agent at the William Morris office and he brought me to Los Angeles. I was teamed up with a guy by the name of Billy Idelson who had a commitment with "The Andy Griffith Show." He needed a partner to write with him...so I did. And we were very successful. The very first show we wrote was the one where Barney plays a mannequin. A dummy. ("The Shoplifters" S:4-E21, 1964) And fortunately, it won the Writers Guild Award...so we felt like we were on our way after that. Casey Chambers: Oh man, that one's hilarious! "Little old ladies ought never to clank." And you hit a home run on your first episode. How about that? Sam Bobrick: Yeah, that was kind of lucky, eh? Casey Chambers: What does winning an award like that do for a television writer? Sam Bobrick: Well, at that time it was a much smaller business. There were only three networks. So basically, almost everybody in the comedy business knew everybody. And everybody in the drama business knew everybody. Once they hear of you, you just start getting assignments. People would call you. They didn't have very many staff jobs in those days. Not on the half hours. What we did with "Andy Griffith..." was...we would go into Aaron Ruben's office where there'd be maybe three teams of writers and come up with about 12 stories. Each team would take four and you'd write them. That's kind of how we did it. We would pitch shows and do the ones we got assigned to do. Casey Chambers: Now, Aaron Ruben...he was the show's producer, right? Sam Bobrick: Yeah. One of the best guys in the world. He was just a terrific guy. I was very lucky to work for him. Aaron was a writer originally. And it was at Danny Thomas and Shel Leonard. They would get writers and turn them into producers. They were one of the first people to do that. They got Aaron to write the original "Andy Griffith Show" and then they got him to produce it. He understood writers. You'd go and pitch a show and he'd get in there with you and try to work out the story. And the nice thing about working with Aaron was he knew what he wanted. So when you finished a story and gave it to him, it was 90% there. And all you did was maybe a little rewrite. I would say 90% of what we wrote went on the air. I liked writing the show when Andy and Don (Knotts) worked together. Everybody on that show was just the way they were on screen and off screen. I became very good friends with Don Knotts. In fact, I had lunch with one of Don's wives. He was married three times. She had remarried. Sweet, sweet lady. Don was just the sweetest guy. And when he died, at his funeral...the two ex-wives showed up too. Because he was just a nice guy. They were all nice on that show. But we didn't get to see too many of them because the writers hardly went down on the set. I'd write at home. I've been fortunate because most of my life, I've been writing at home. Except when I'd have to produce a show or be on a staff. Then I'd have to go down to the office or to the lot. But after Aaron and Don left the show, I just didn't enjoy writing it as much. So, I went looking for other things. When Aaron went to produce "Gomer Pyle, U.S.M.C. "...I wrote over there. But I did a bunch of different half hour shows. Nowadays, they got so many people on the staff that by the time a writer hands in a script, it is so rewritten that there is very little left. That's the process now. Casey Chambers: You were also a writer for the "Smothers Brothers Comedy Hour." So I started writing variety and I loved variety. That was the most fun because it was show business. We'd write sketches. They'd have an orchestra. They'd have a studio and an audience. That was fun. That was fun writing. And then there would be specials. We did so many TV specials. They had specials for everybody. But then variety shows kind of dried up. Now, there's so much stuff on the air. So much entertainment. I don't know who's a star anymore. Casey Chambers: There were a lot of musical acts that performed on the Smothers Brothers show. Were there any in particular that you enjoyed? Sam Bobrick: Oh, yeah! Simon & Garfunkel came on. I loved them. When Simon & Garfunkel broke up...ah...I mean I just loved them. Casey Chambers: Tell me one of your favorite songs. Sam Bobrick: Oh gosh. Of course, "Bridge Over Troubled Water." "The Boxer." But I also liked Carole King. I liked the Motown music. I guess I like the more dated singers (laughs)...but I do like all the singers that I grew up with. Casey Chambers: If you don't mind, I'd like to jump back to "The Andy Griffith Show." Did you ever write any episodes that were drawn from some of your own childhood memories? Sam Bobrick: Oh sure. I did. I did. (laughs) My favorite one was a thing called, "The Case Of The Punch In The Nose." (S5:E25, 1965) I grew up in a small town. And I had an uncle who every time he got mad at someone, he'd punch 'em in the nose. He punched the dog catcher in the nose. He punched the neighbor in the nose. (laughs) So we came up with this idea where Barney discovers an unsolved case. Someone was punched in the nose but nobody got put away for it. And so he tries to find out who punched who in the nose. And he winds up getting the whole town punching everybody. It was kind of fun. Sam Bobrick: And then I remember Old Blue the dog...remember? ("Barney's Bloodhound" S5:E6 - 1964) I had another uncle that got drunk and brought home a...not a Great Dane but a Saint Bernard. I don't know where he got it. We had a little cottage on our property. And I remember he put the Saint Bernard in the cottage. And my grandfather went inside to get something and he saw this dog and thought it was a bear. (laughs) So, Barney finds this dog and just loves the dog. Called him Old Blue. And that was kind of an idea that sparked from...getting a strange dog. You never know what you're going to get. (laughs) My uncle finally took him back to where he belonged. Casey Chambers: I remember all those episodes. Good stuff! You mentioned you were from a small town. Where did you grow up? Sam Bobrick: Well, my high school days were spent in Benton Harbor, Michigan. My grandpa and grandmother had a farm and I would spend most of my young life there. I originally lived in Chicago. But my mother and father kept fighting and separating and I kept getting sent to my grandmother. It was a great town. It was like the play "Our Town." Very pleasant, there. Unfortunately, like with all the small towns, it went south. When the car business went bad, I guess. But, Michigan was a great state at one time. All the roads were nice because they were making cars in Detroit. All the roads had to be nice. But then, times change. They were starting to send all the things that had to be manufactured to other countries. The work in little towns dried up. In Benton Harbor...a lot of big name factories around there closed. And maybe about 15 years after I left, it became kind of run down. The whole town of Benton Harbor just seemed to collapse. It was sad. Casey Chambers: Where did you go when you left? Sam Bobrick: Well, after high school, I went to college for a year. I didn't like it so I joined the Air Force for various reasons. When I came out...I finished college. I don't know how old I was when I went to New York, but I spent five or six years in New York before I came out here. So, I kind of knew both worlds. The small town and the big town. Casey Chambers: I'd like to ask about the song you wrote that was recorded by Elvis back in 1960...."The Girl Of My Best Friend." What a cool, cool feather. Sam Bobrick: Sure. That was when I was writing in New York. I wrote the song with Beverly Ross. Beverly had written a bunch of songs for Bill Haley. She made it when she was very, very young. And we met at a party. She said, 'Why don't we write a song together?' And just like that. I said, 'Okay.' It was the first song we wrote...and after that...we never wrote anything good. (laughs) I still had to make a living and was writing game shows and radio shows at the time. And that didn't make much money. But, wherever I could, I would do the shows. Casey Chambers: So how did Elvis get ahold of that song? Sam Bobrick: Beverly had a deal with Hill & Range. That was a publishing house. She just took the song in there and they liked it. So, they brought it down to Elvis. And that's how it got done. I didn't know Elvis recorded it until it came out. Beverly called me and said, 'We have a song on the new Elvis album!" 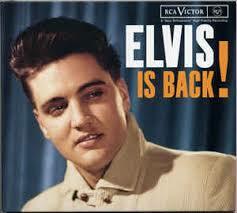 On his "Elvis Is Back!" album, I think it was called. And I thought to myself, this is it. I'm going to write songs for the rest of my life. But I just couldn't make a living. It was very, very tough. And I obviously wasn't that good. I did a couple of those "Mad Magazine" albums but didn't make any money from that. So, I had to go back to writing, which I'm very glad I did. But I liked Elvis. I thought he was great. When I was in the Air Force, I was young and we'd go out dancing to "Hound Dog" and all those songs. "Blue Suede Shoes." I liked Elvis a lot. I like him even more now. Casey Chambers: It's a fantastic song. I hadn't heard it until I picked up the album. But it was released as a single in Europe and became a really big hit. Sam Bobrick: Yeah, it was like #1 in Europe. And I don't know why they didn't release it here. I just have no idea why. It was later covered by Ral Donner (1961) and it made the charts again. Casey Chambers: One of the songs you did for the Mad Magazine albums was "It's A Gas." (1963) The song was perfect for Mad. Dr. Demento gave it some exposure, for sure. And it still gets airplay. Sam Bobrick: Yeah, Howard Stern plays it on his show. 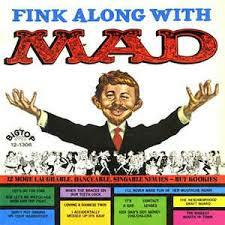 "Fink Along With Mad" (1963) was a fun album. I was writing with Norman Blagman at the time. We didn't record it for Mad. What happened was, we had an idea to write comedy songs. Wild parodies. And we showed them to RCA, but they were afraid to release it. Then we brought it over to Mad, and they loved it. But they later sold it to another company that just couldn't handle it and then they kind of faded out. They're collector's items now, I understand. We didn't make hardly any money from that. It sold very, very few. And I don't know why. It was a funny album at the time. Casey Chambers: You've been involved in music, television, and theater and you worked it out. And that's pretty badass. Your career reminds me of a line from a film, "You improvise. You adapt. You overcome." Well done. Sam Bobrick: Yeah, I have had a long career, and in fact, I still write plays now. But everything changes. On Broadway, you really don't find American comedies. Most everything now is musicals. Most of the plays on Broadway come from Europe where people have already seen them. But I just got notified yesterday that a couple of my plays are in Russia now. And they're big hits. But you never know where your plays are going to end up. I've written a number of plays. About 40 of them. A couple of dozen were published. And some of the ones that weren't published still get produced. And it's kind of like a mom and pop business. I get produced mostly in community theatres. And when someone goes to see a show produced in a small town, I never know how it turns out. I never know it's playing there. But I just love playwriting. It's a purer business. This is what I wrote. Here it is. Casey Chambers: Well, we've only scratched the surface, but I've taken up way too much of your time. I'd like to thank you very much Mr. Bobrick for all the entertainment you've given us throughout the years. It's been an honor speaking with you. Sam Bobrick: No problem at all, Casey. It was great. And good luck to you.